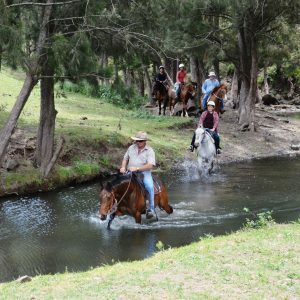 Horse rides catering for beginner riders up to the more experienced. We offer 1-hour and 2-hour horse trail rides. All rides are rated to suit the weakest rider in the group, this ensures that everyone has a great time and comes home safely. On long weekends and Easter we do not do 2-hour rides. 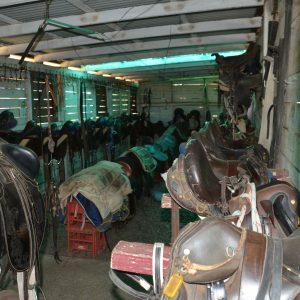 Riding lessons run for about 30 to 45 mins. During your first lesson, you will learn how to sit correctly, where you should have your feet and how to hold on. By the end of your lesson, you will be able to guide your horse to the left and the right, complete a simple obstacle course, walk the horse and if you have shown good progress trot the horse by yourself. This is a great way for children and adults to master the skills needed for a trail ride and to go riding outside the enclosed yard with confidence and safety. Parent-led horse rides are available for children who have never ridden before or are nervous about having a lesson or are just too young to have a lesson but are keen to have a go. 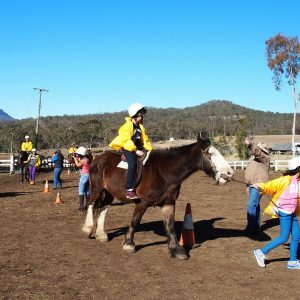 These are parent-led horse rides and it is a great way to introduce younger children to the fun of horse riding without the responsibility of having to control the horse. I promise you that you will tire before the child. Minimum age 2. Introduction lesson in round yard, 30 to 45 minutes $45.00 per person. Minimum age 7. Helmets are compulsory and all riders must complete a rider profile, adhere to the trail ride rules and follow staff instructions whilst on rides. Download Horse Riding Application Form (Covers parent led rides, lessons and trail rides). Print and complete and hand in at check-in. Download Parent Led Ride Application (Covers parent led rides only).